2006: "Best Drive in Class"
2011: "Best Drive In Class"
Abarth chassis number 563254, Carrozzeria Zagato number 87 was imported by the Roosevelt Automobile Company owned by Franklin Delano Roosevelt Jr. As was the case with many of the Double Bubbles, number 87 was immediately converted from a street car to its present racing form. The car was campaigned for the next 20 years in SCCA events at venues such as Watkins Glen, Cumberland, Bridgehampton, Lime Rock and VIR. Later, it was then raced in vintage events at many of the same tracks. Abarth #87 is currently being raced with vintage organizations such as the VSCCA and VRG and represented 1 of only a handful still actively campaigned around the world. First seen at the 1955 Turin Auto Show, 750 GTs were racing in March 1956, and quickly scored a clean sweep of the 750cc Gran Turismo Class at the 1956 and 1957 Mille Miglias. The 750 GT was the perfect entry level car for “Gentlemen Racers”, who could drive to the track, win their class and drive home, and it quickly became the core of Abarth’s business. Abarth had also made a deal with Fiat that the company would pay him for wins and second places for Fiat-Abarths, so the more cars he built the better. The first two series were fairly small in number but there were more Series III cars, following a record-setting session at Monza in July of 1957. Raced around the circuit for four days, the Zagato coupe broke 15 records including averaging 165.346 km/h. Later versions were bored out as far as 981cc, some with double-overhead cam options and the Record Monza was developed from the Zagato “double bubble”, though it’s not nearly as attractive. In 1956, Abarth had already built up an extensive reputation as a premier tuner of Fiat engines and was branching out into many classes of motor sport. To compete in the 750cc class of the Grand Touring Championship, Abarth commissioned Zagato to rebody the Fiat 600 into a purposeful racecar. Thanks to Zagato’s weight saving body, the first cars weighed 1179 lbs (535 kg) and took advantage of Abarth’s 747cc tuned engine. With a high compression head and specially made exhaust the produced power was 47 bhp @ 6000 rpm. A number of prototype cars were made in 1956 and one of these appeared at the 1956 Mille Miglia and placed second in class. The production 750 Zagato first appeared at the 1956 Geneva Motor Show. Series production began in 1957 of the ‘Zagato 750 GT’ at the beginning of 1957. The final design included twin bumperettes upfront, Zagato’s double bubble roof and twin intakes on the rear engine cover. Five of these cars finished the Mille Miglia in 1957, of which Alfonso Thiele won the 750cc class. In July of 1957, Abarth committed to a record-breaking car with sleek Pininfarina-designed body, tube frame chassis and 747cc engine. Raced around the Monza circuit for four days, the car took 15 new records including the fastest average speed of 165.376 kph for 72 hours straight. At the 1958 Paris Motor Show, Abarth launched and renamed the ‘750 GT Zagato’ into the ’750 Record Monza Zagato’. This was done to honor the results achieved the year earlier with the record breaking car. Improvements to the model included a DOHC valvetrain and three-quarter windows. 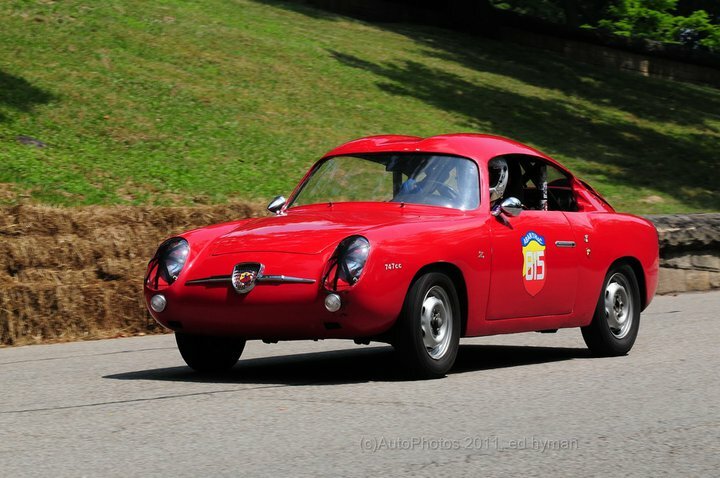 Abarth 750 GTs took class and overall victories at the 1958 Sestrière rally, and four out of five finished the Sebring 12 Hours, one winning its class. One bold soul even entered a 750 GT at the Santa Ana drag strip in California, winning the under 1500cc Sports Class – then took a second at the SCCA races at Palm Springs. The 750 GT remained competitive into the 1960s, and returned years later to pose the same threat in vintage races.